Qarib Qarib Singlle is a story of two individuals who differ in their personality but have a common need for dedicated companionship. 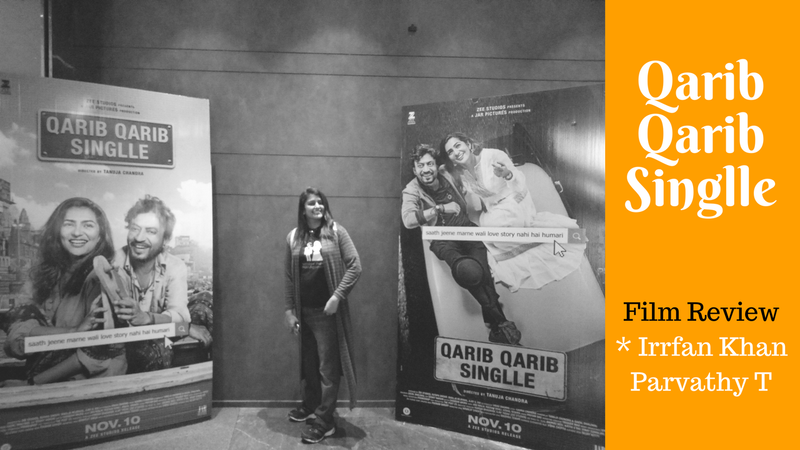 Qarib Qarib Single or QQS is an endearing story of a 35-year-old Jaya AKA Jayashree who is a self-reliant, independent woman living a lonely life in her posh apartment. When she is not working, she often chats with her younger brother who had moved abroad for his education or the so-called friends who turn to her when they want her to run small errands for them including babysitting their kids. She is a military man' widow and was very endearingly told by a friend that is she does not start to mingle, she may risk turning back to a virgin. Scared as hell or tired with her empty life, she logs into a Tinder kind of dating website "Ab Tak Single" where she meets Yogi, a free-spirited eternal romantic, who may not have "Ab tak chappan" girlfriends but had 3 solid affairs ranging from Varanasi to Jaipur to Gangtok. As expected, he is not the guy Jaya was looking for and she even tries to scoot out. As expected, he did not let her scoot out so easily before they both can meet all his GFs to affirm if they still pine for him or not. Together they travel the road never traveled. It is a fun-filled road/ air/rail trip movie and stops at the mountain trolley in Gangtok. Qareeb Qareeb Single starring Irrfan Khan and Parvathi T is a must watch film. Irrfan's Yogi is as charming as ever. He has a depth of character, a great sense of humor and an absolute deadpan acting to leave you engaged. If I have to sum up QQS in a line, I would say- Pura Pura Irrfan Khan Film. A lot of local flavors are induced in the film from Varanasi's Chatori Mathari to a beautiful "The Baker's Cafe" in Gangtok. It is a mature love story but not the one where lovers die for each other, and that is what you will love about this film. It is endearing and has full of Irrfan khan charm. The movie has its own cliche of scenes but Irrfan Khan makes them look fresh and enjoyable. There are two surprise cameo by Nehi Dhupia and Esha Shravani played with equal elan. Numerounity Verdict: The movie has a fantabulous first half but a weaker second half. The music is quite good and is smartly placed to keep the flow. Overall, it is an interesting watch.